Hints for "A Keeper's Training"
General Remarks about "A Keeper's Training" in the "Lytha Way"
The training mission confronts the player with the first problems, if he intends to deal as few damages as possible. 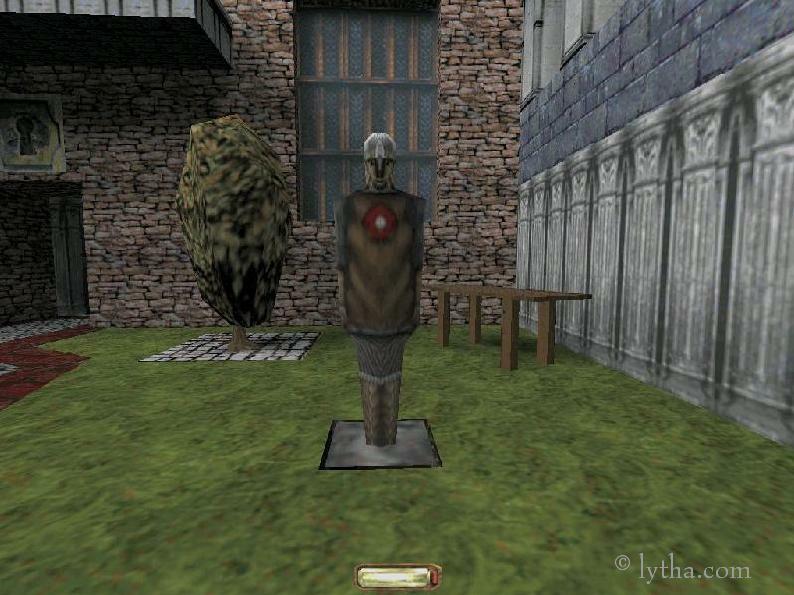 Not because of the sparring, but because of the most evil enemy in the entire game: The wooden Dummy. 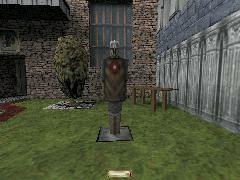 The Keeper wants you to deal a hit from the left, the right, and from above against this wooden Dummy. It will only disappear disappear, as soon as these hits have been dealt. 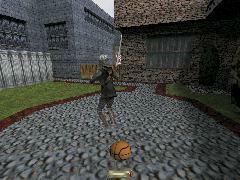 Usually, this section of the game leads to the only few damages dealt in the entire game. I was able to reduce the amount of damages dealt down to 10 (did not hit with full force, I guess), but it is always a question of the momentary luck. 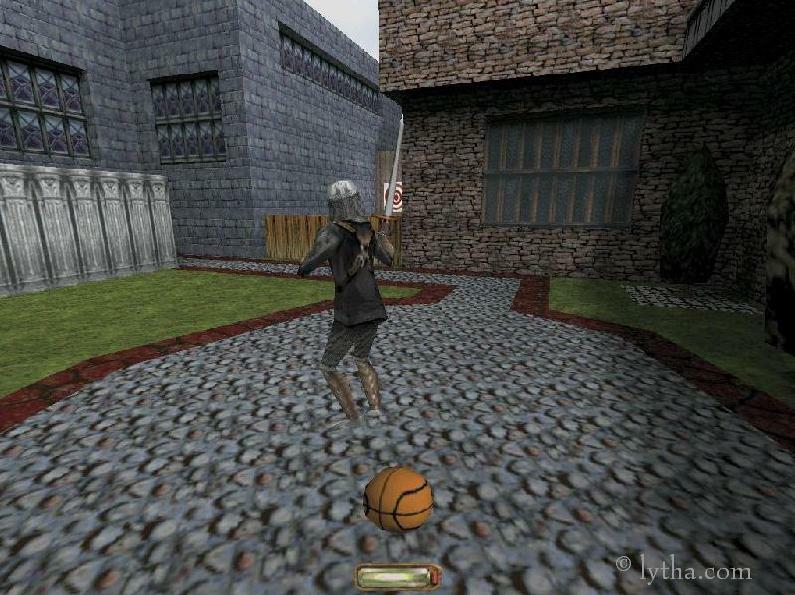 The Keeper (and the Sparring Partner too) want you to train your sword-fighting abilities. Avoid even to draw your sword while you are in the red circle. As soon as the Sparring Partner has dealt about 100 damages, the sparring will end. Take the opportunity to train your circling+strafing, your jumping+turning, and last but not least, your NPC-jumping (see also below) with an angry target. The roofs at the balconies are pretty target areas for your NPC-jumps. Fun equals in most cases "how to reach some rooftops" and so it is also in this mission. Firstly, we thought that the final frontier for the roof-climbers in this mission was the roof at the second rope. 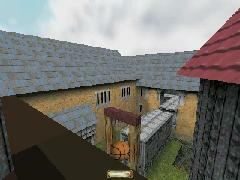 This roof is one of the trickiest-to-reach areas in the entire game. To reach it, the player needs (a) patience (lots of), (b) luck, (c) no fear of recieving lots of damages. 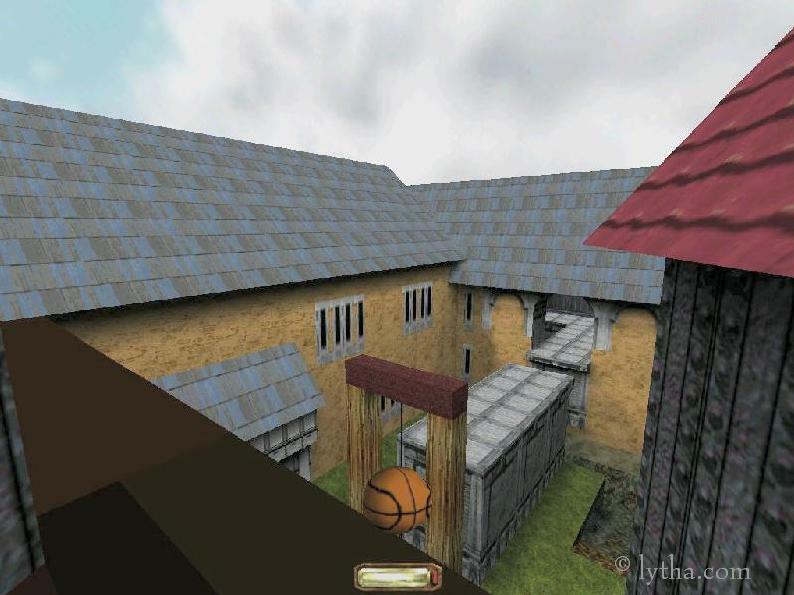 To reach it, one needs to run+jump+mantle Garrett to the opposite roof (the roof above the red door), aiming at the right corner. As soon as Garrett has a more or less stable grip, one needs to turn right, until the grey wall is faced. Then this wall needs to be jumped at, so that Garrett can mantle himself onto it. But as it can be expected after the starting words of the paragraphs above, there is yet another final frontier for the crazy roof-climbers. The target in this case is relatively easy to describe: The windows in the Shadow-Room, meaning, in the room where Garrett shall learn to move unseen. To reach this area, it is necessary to get used to one of the bugs of the game: The NPC-jumping. Lets take the Keeper in this shadow-room as the first target practice. 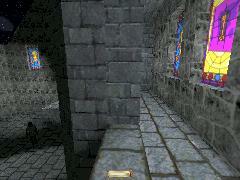 As soon as you have completed the objective to cross the room unseen, the Keeper will congratulate you and walk to the shadows on the floor of the room. Follow him. Stand immediately infront of him, and face him. Now turn a tiny bit to the side. Lean forward, so that Garrett's head is slightly at the side of the Keeper. Now turn to face the Keeper, and jump in the same moment. If you are now flying like a rocket through the room, you have done it correctly. Learning how to aim a NPC-jump is a different topic, but after some practice, it is not as difficult no more as when you started this lesson. And after a while, you should be able to aim your NPC-jump correctly, so that you won't hit the ceiling no more, but enter the small room at the windows. Hmmm... was there something else? Oh yes: The Basketball-Room. It is only accessible in Expert Difficulty, and the door can be whacked open with the sword. Enter the area where the Sparring Partner came from before the Sparring is finished. The basketball (or alternatively the quotes-bedroll) are known as being the luck-giving toys for the craziest of the roof-climbers.